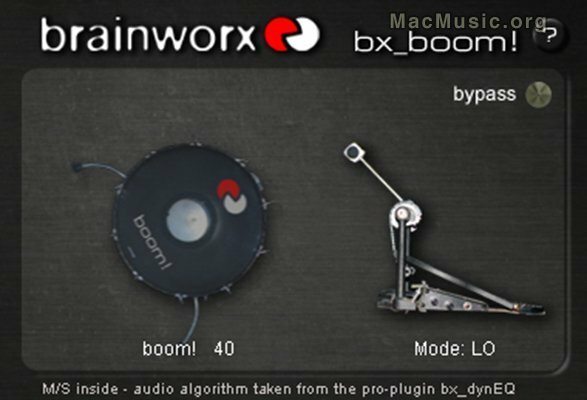 Brainworx announces that its bx_boom! plug-in is now available separately from the bx_dynEQ plug-in bundle (which it is still included with). bx_boom! is actually the one bx_dynEQ preset demonstrating the superior M/S features of this EQ best. Stripped down to only 2 parameters and an intuitive graphic design this tools enables you to attenuate or boost the impact of your bass drum sound - in a final mix (!) or a complete stereo drum-loop. bx_boom! is only availble as a true stereo plug-in due to the M/S nature of the beast. • 3 different modes (lo / mid / hi). • Hi-end Brainworx band pass-filters. • Boost and attenuate your bass-drum in a final mix(!) or an individual drum loop. • Dedicated BYPASS switch (cymbal sign) in the plug-in GUI. • "Mouse over feature": adjust the parameters by holding the mouse over the bass-drum or the pedal and simply turn your mouse wheel. • Direct access: just type in any valid number into the text fields for direct access to the exact value. bx_boom! is available now for Windows and Mac OS X in VST, AU, RTAS and TDM formats. Pricing starts at €89 (+VAT).